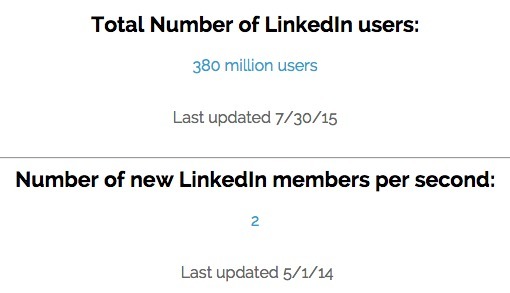 Lovely LinkedIn Statistics - Peter Levitan & Co. I received well over 2,000 referrals to this website from LinkedIn last year. I like that. I work it so it happens. In addition, hundreds of people in my network and in related fields have read my LinkedIn posts. Virtually all of my advertising agency clients come in as a result of my daily social media activity on this blog, LinkedIn, Twitter, guest posts and occasional commenting on other websites..
125 LinkedIn Statistics From DMR. And, for your reading pleasure, here are links to my blog post missives on LinkedIn and how LinkedIn can be used to grow your business. This entry was posted in Marketing, Social Media and tagged branding, digital marketing, LinkedIn, social media. Bookmark the permalink. Trackbacks are closed, but you can post a comment.